God loves his children. He commanded parents to "train up a child in the way he should go" (Proverbs 22:6). We want each child to know that he or she is a star in Jesus' eyes, no matter what the child's skills and abilities are. Jesus loves children just as they are. All-Stars for Jesus Bible Clubs are designed to help churches and parents teach children to know God, to believe in Jesus as their Savior, and to live for Him. All-Stars for Jesus Bible Clubs help children to feel loved and accepted so they, in turn, can share the love of Jesus with their friends and families. Researchers say that 43% of people who are Christians accepted Christ as Savior before the age of 13! We want to help you reach that 43%...and more! Bible clubs also offer a non-threatening place for children who might never attend a regular church service or Sunday school class to learn about Jesus in a fun, casual atmosphere. In a whole where children are exposed to a variety of bad influences coming from all directions, All-Stars for Jesus Bible Clubs are places of love and encouragement, where kids can safely learn how to say no to those bad influences and learn how to live a victorious life in Christ! So...what exactly IS All-Stars for Jesus? All-Stars for Jesus provides everything you need for an exciting ministry to children! A multi-use Bible curriculum in a fun club environment for age 2 through grade 6, with an optional awards program. A program that provides solid Bible teaching in a fun and interesting way for kids—one that directs them to know and follow Jesus. Curriculum that is easy to teach and includes helpful options for teachers, giving you maximum flexibility. Age appropriate memory verses to help children hide God's Word in their hearts. Bible- and curriculum-based, rather than activity-based. Each part of the lesson focuses on God, Jesus, and God's Word. Age appropriate and fun for kids of all ages. Bible-centered—every activity helps kids focus on God's Word and begin to share what they learn with others. A way to help churches reach the children and families in their communities for Christ. The All-Stars for Jesus Bible Club program is designed to lead children from age two through sixth grade to a personal faith in Jesus, to teach them about God's love and care, to encourage them to grow spiritually, and to give them a solid biblical foundation for their lives. All-Stars for Jesus partners with churches to extend their outreach from just Sunday school to mid-week, Sunday evening, or other times children can gather to learn about Jesus. All-Stars meetings are fun, less formal time with a variety of interesting and fun activities to direct the child's attention to God's Word. The optional awards program offers a further way to extend the Bible learning into the home. What unique features does All-Stars for Jesus have? Each All-Stars for Jesus age-level Flex-lesson Leader's Guide has everything you need for two meetings a week—to use for Sunday morning and mid-week, Sunday evening and after-school Bible club, or whenever great Bible lessons are needed. Or, you have extra options for one meeting a week! Easy-Trac meeting plans direct the leader step-by-step through each weekly program, and let you see at a glance which activities and materials to use. The optional awards program provides more opportunities for kids to learn about Jesus by completing Bible learning activities in their award books at home. When each activity is completed, children earn colorful awards to place on a cap or pennant. Plus, each child could have ALL first-year awards for as low as 82 cents per week! All-Stars for Jesus offers not only five age-level programs for children age 2 through grade 6, but also the All-Stars Explorers program for combined grades 1 through 6 in one classroom and the Preschool All-in-One Kit for combined ages 2-5 plus reproducible activity sheets. There are no membership fees, dues, or doctrinal requirements—just fun, Bible-based, solid Christian learning. The All-Stars Promo Kits (included with your Starter Kits) offer great resources to promote your clubs: promotional posters, clip art, fundraising ideas, and club kickoff plans! 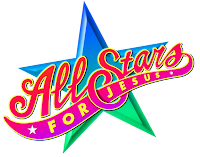 All-Stars for Jesus offers lots of colorful "fun stuff" as gifts, awards, and promotions. All-Stars for Jesus is an affordable program. The Flex-Lesson Leader's Guide provides two lessons a week! Christian Ed Warehouse offers Standing Orders on All-Stars for Jesus quarterly curriculum so you don't even have to remember to order! Plus, Standing Orders receive a 10%-%15 discount every quarter. We'll send you an email reminder so you can make changes before your curriculum ships. There is no requirement that you use all available materials—just choose the options that will work best with your group and your finances. Does all this sound like something you would like for your church? Visit eChurchDepot.com and order your Starter Kits for a 60-day risk-free review! Or download FREE samples of each age level and order a FREE Lesson Sampler to review with your church. May God bless you as you lead children and their families to a personal relationship with Jesus.